Featherweight prospect Toka “T-Nice” Khan-Clary’s (22-1-0-1, 15 KOs) life, especially his childhood, was extremely difficult, to say the least, yet no matter what kind of daunting obstacles he has had to face, he always stayed focused and figured a way to overcome them. Such was the case last September when he was moving up the divisional rankings as an undefeated fighter, who was ranked in the top fifteen by the NABF. Things quickly unravel for him; however, when he suffer an unexpected first-round knockout loss to unknown fighter Jhon Gemino. Gemino not only knockout Khan-Clary, but did it within the first minute, via a powerful right hook. If the loss was not bad enough, Top Rank, who promoted Khan-Clary since he made his professional debut five years ago, did not know what to do with him following his defeat, so they released him. Khan-Clary took the setback in stride. He did not give up or get discouraged, instead he worked on a plan to turn things around, as he has done his entire life. He took a step toward regaining his stalled momentum when he signed a three-year promotional contract with Real Deal Sports & Entertainment, the new promotional company that is co-owned by former four-time heavyweight world champion and newly inducted into the International Boxing Hall-of-Fame, Evander Holyfield. The soon to be twenty-five-year-old southpaw fighting out of Providence, Rhode Island made a successful debut on his new promoter’s banner last Saturday at the Freedom Hall in Louisville, Kentucky with an eight-round unanimous decision over Angel “El Gato” Luna. Khan-Clary pitched a near shutout as he prevailed on two scorecards 80-72 and 79-73 on the other. He dominated this one-sided fight and scored a knockdown in the seventh round from a right uppercut. This fight was nationally broadcasted on the CBS Sports Network Real Deal Championship Boxing. He will look to extend his three-bout winning streak and work toward fighting a top-ten boxer and then a world title fight, as he takes on a TBA opponent in September, in a ten-round bout for an undetermined title. Khan-Clary has looked really impressive in his other two bouts following his loss. In his first fight, he made quick work of Marco Macias with a second-round knockout, in which he scored two knockdowns. Last month, he brutally defeated Francisco Medel with a first-round technical knockout. He recorded four knockdowns in the opening round. Khan-Clary has seven knockdowns in his last three fights. While Khan-Clary’s first professional defeat and losing his promoter was a major setback for him, it was nothing compared to the trials and tribulations that he has had to overcome to get to this point in this life. His father moved him and his younger sister to America from Liberia when he was six-years-old and a year later; his father was shot to death. He never knew his mother or his other siblings. So, from an extremely early age, he and his sister were left to survive on their own. They moved from one troubling foster home to another, many of which did not have electricity. Khan-Clary and his sister were homeless for several lengthy periods of time during their childhood. Even when Khan-Clary discovered boxing at the age of fourteen, which helped him avoid getting mixed up in the wrong crowd and set him on a successful path, it did not come without additional challenges, like having to bike seven miles to and from the gym, even in the winter. Khan-Clary has the skills to potentially become a contender in the featherweight division. He is a multidimensional fighter who can either box and or slug it out with equal success. He commands a lethal jab, has tremendous speed, and packs a great deal of power in both hands. 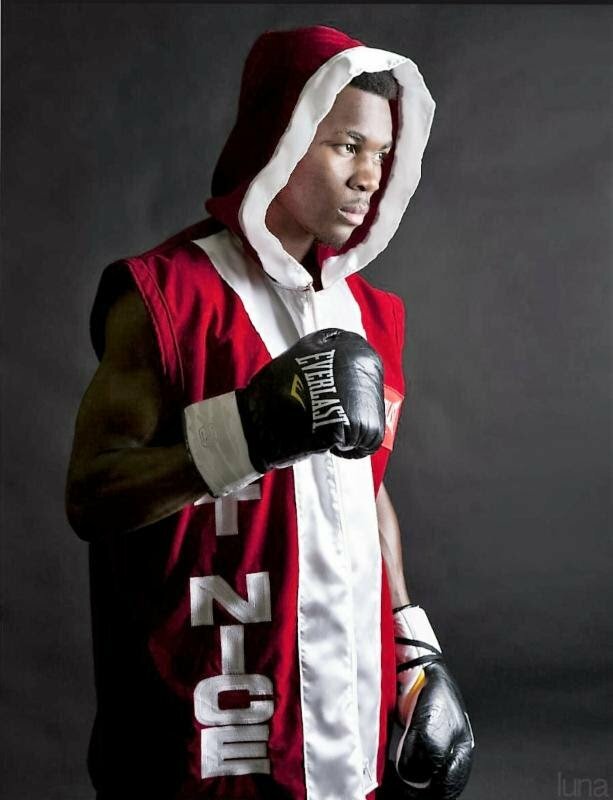 Although he has not faced the best competition early on in his career, he is a fairly young fighter who has gained invaluable experience over the last couple of years by sparring with former and current world champions: Chris Algieri, Javor Fortuna, Rau’shee Warren, Gary Russell, Joel Diaz, and the like. Now with longtime trainer Peter Manfredo, Sr., who has been with him for the last ten years, back in his corner, after they briefly parted ways for one bout following his loss, it gives Khan-Clary the additional comfort and confidence that he needs to take his fight game to the next level. For more information and the latest updates on Kahn-Clary, follow him on Twitter and Instagram @tokakahnclary or friend him on Facebook at tokakhan. “I will become a world champion because I have the heart, ability, determination, and work ethic that no one else can match,” said Khan-Clary.